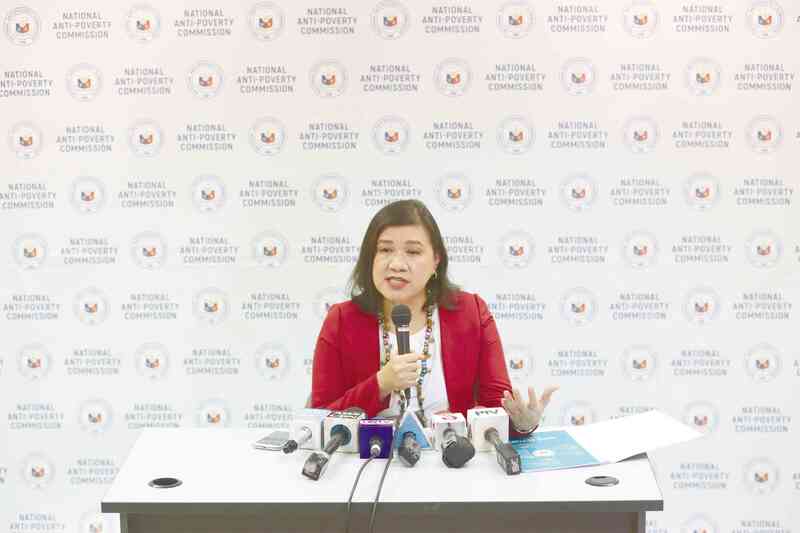 National Anti-Poverty Commission (NAPC) Secretary Liza Maza resigned on Monday, saying she had lost hope that the Duterte administration could deliver genuine socioeconomic and political reforms after it terminated peace talks with communist insurgents. “I joined the Cabinet more than two years ago with high hopes of helping to facilitate meaningful socioeconomic and political reforms from within the government, when the President was initially engaged in the peace negotiations that can potentially bring these about,” Maza said, reading from a statement at a news conference. “His latest pronouncements, however, of finally terminating the talks brings me to the conclusion that these reforms may no longer be possible under the current administration,” she said. Maza said she handed her resignation to President Duterte on Monday morning, less than a week after a court in Cabanatuan City, Nueva Ecija province, dismissed double-murder charges that had been brought against her and former Bayan Muna Representatives Satur Ocampo and Teodoro Casiño, and former Agrarian Reform Secretary Rafael Mariano. Maza surfaced on Aug. 13 after Cabanatuan Regional Trial Court Judge Trese Wenceslao dismissed the charges and voided the warrants of arrest issued for her and the three other former lawmakers identified with the Left. The so-called Makabayan 4 had called the order to arrest them a revival of the persecution of leftist groups during the administration of President Gloria Macapagal-Arroyo, who is now Speaker of the House of Representatives and an ally of President Duterte. Their protest reportedly incensed some businessmen, who offered a P1-million peso bounty for their capture if they refused to surrender. Malacañang and the Philippine National Police had called on Maza and her companions to surrender but they had refused, saying the charges, which they had described as trumped-up, should not have prospered under the rule of law. They had brought a motion for reconsideration, which the court granted after finding no sufficient evidence to put them on trial. Maza said the revival of the charges and the order for her arrest took a toll on her work in the NAPC, but her departure did not mean she was giving up on the pursuit of reforms. “This is not a surrender of the pursuit of meaningful reforms that we have embarked on in my two years of leading the NAPC, and which have always been my life’s work as an activist and legislator, nor I am succumbing to the reactionary forces that have long wanted me out of this post,” Maza said. The groups interested in the programs of the NAPC have “consolidated their forces,” she said, without elaborating. “I realized that similar attacks by the antireform, rightist and militarist forces in our society will continue to undermine my leadership of this agency. As such I can no longer work under these circumstances,” she said. But the bigger reason for her departure, she said, was President Duterte’s “categorical and final” declaration on Aug. 14 that he was terminating peace talks with the communist movement. She said the NAPC could not achieve the economic, social and political reforms it was working for without genuine negotiations for peace. Maza said she would return to private life and pursue her advocacies as a street parliamentarian. Malacañang thanked Maza for serving on the government’s antipoverty program and expressed regret at her departure. “We always regret when people who enjoy the President’s trust and confidence leave,” presidential spokesperson Harry Roque said at a news briefing on Monday. Roque, however, said he did not know why Maza had to link her job to the peace negotiations.